Tuesday morning we got a call at 8:00 am from a couple camping at a Karen homestay in Mae Wang. They wanted to stay the night, and they also wanted to know if it would be possible to have a wedding that day. We love LOVE and spontaneity so we said YES! The monks at the temple seemed to be surprised by the last minute request for such and important day but happily agreed to prepare the Buddhist blessing ceremony. Kelsie and Matt started the day with rafting on a bamboo raft to take in the beauty of Mae Wang national park. Then they has a riverside picnic where they were greeted by an elephant. Then it was time for Thai massage and the blessing at the forest temple. Serendipity was the theme that day. One of Chiang Mai’s best photographers, Toon, came up to document the day. 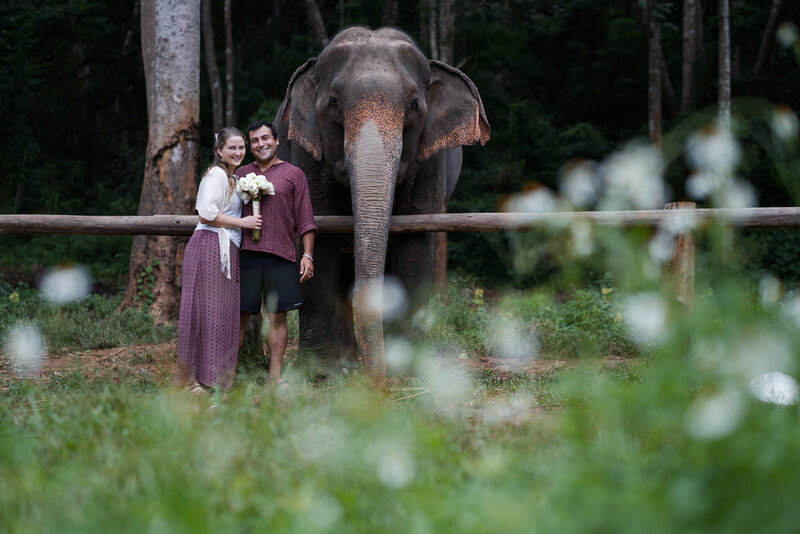 The weather, elephants, and our favorite cake baker all conspired to make the day perfect and magical. Thank you Matt and Kelsie for letting Chai Lai be part of your love story. World Elephant Day, August 12, is dedicated to the preservation and protection of the world's elephants. The goal of International Elephant Day is to create awareness of the urgent plight of African and Asian elephants, and to share knowledge and positive solutions for the better care and management of captive and wild elephants. African elephants are listed as "Vulnerable" and Asian elephants as "Endangered" on the IUCN Red List of threatened species. One conservationist has stated that both African and Asian elephants face extinction within twelve years. The current population estimates are about 400,000 for African elephants and 40,000 for Asian elephants, although it has been argued that these numbers are much too high. The Karen are one of more 70 ethnic minorities in Thailand. The Karen, Kayin, Kariang or Yang people refer to a number of individual Sino-Tibetan language speaking ethnic groups, many of which do not share a common language or culture. These Karen groups reside primarily in Karen State, southern and southeastern Myanmar. The Karen make up approximately 7 percent of the total Burmese population with approximately 5 million people. A large number of Karen have migrated to Thailand to escape war. The fighting began in 1949 and is one of the world's longest running civil wars. Like indigenous people in most of the world do not have land rights. The Karen languages are tonal languages spoken by some seven million Karen people. They are of unclear affiliation within the Sino-Tibetan languages. The Karen languages are written using the Burmese script. The Karen languages are also considered unusual for not having any Chinese influence. Would you like learn some useful phrases? Check out Noon's online Karen language lessons. Noon teaches Karen, Thai, and English at Chai Lai. Karen legends refer to a 'river of running sand' which ancestors reputedly crossed. Many Karen think this refers to the Gobi Desert. There are few written records of the Karen origin story. The Karen people began to inhabit what eventually became Burma about two thousand years ago. They traveled from Tibet and China and settled largely in the hills bordering the eastern mountainous region of Burma. Ethnic groups around this region included the Mon, Shan, Thai, Burmese and Karen. When the British colonized Burma in 1886, these groups all became part of Burma. Hundreds of thousands of Karen fled to refugee camps while many others are internally displaced persons (IDPS) within the Karen state. The refugees were concentrated in camps along the Thailand-Myanmar border. The camps have suffered from overcrowding, disease, and periodic attacks by the Myanmar army. Many Karen are stateless and do not have access to basic human rights. Thailand does not recognize them as refugees but as illegal immigrants. Life in the refugee camps is difficult and uncertain. Refugees are not allowed to venture outside the camps, and can be arrested if caught. They apply for resettlement to a 3rd country, which can take many years or never materialize at all. The Burmese army has planted landmines in Karen state making it unsafe to go back. The majority of Karens are Theravada Buddhists who also practice animism, while approximately 15% are Christian. Karen animism is defined by a belief in klar (soul), thirty-seven spirits that embody every individual. Misfortune and sickness are believed to be caused by klar that wander away, and death occurs when all thirty-seven klar leave the body. Rotational farming is a type of forest management used by the Karen which has been a part of their culture for at least several hundred years. Sacred forests are often seen as reservoirs of local biodiversity that preserve a unique fauna and flora including their medicinal plants. Depending on location and management, sacred forest provide a number of other ecosystem services such as cultural amenities but many of these aspects remain poorly explored. Ecosystem services in the form of medicinal plants from sacred forest can be important for indigenous people in remote areas, since many rural communities depend on wild plants for their diet and livelihood. Karen clothing is handwoven with a loom. Our clothing has meaning. Not all Karen people wear the same clothing, they have identity with age. When they are young and have not already married, they used to wear a long white dress. Once they marry they have to wear colorful shirt with skirt that is wrapped around at their waist. In their own culture if they didn’t obey this tradition, a tiger will come eat them or take them away. Wearing Karen clothes shows our loyalty to our ancestors. Suki the baby elephant gets her first toys. Watch a baby elephant play! Visit Suki at the ChaiLaiOrchid.com in Chiang Mai, Thailand. Warning: this might be the cutest thing you have ever seen. Our lovely volunteer Kate made this adorable video of baby elephant Suki playing with her first soccer ball. We are overjoyed to announce the newest member of the Chai Lai Family! Wooohoo!!! After almost 2 years of waiting, Mae Noi and Som Chai’s adorable daughter arrived last night. She was born just after midnight on Thursday so we nicknamed her Wan Suk. 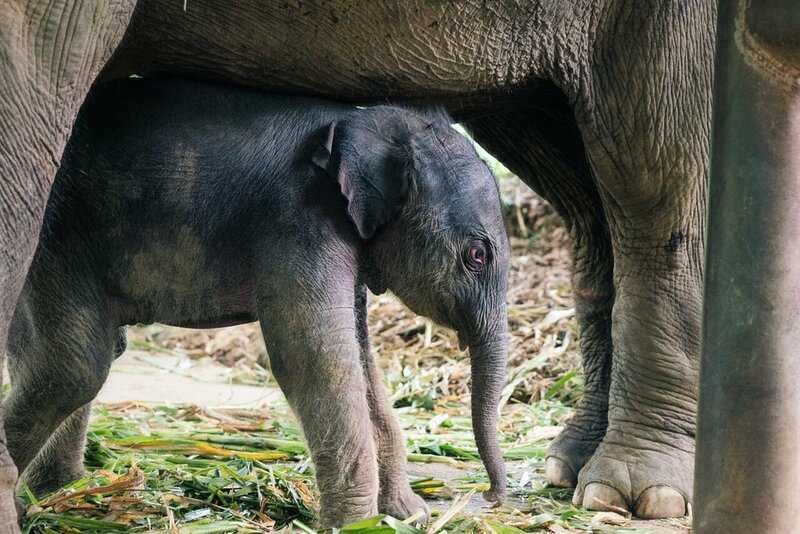 Mae Noi’s labor was much shorter than her first labor and luckily both the calf and the mother are happy and healthy! Mae Noi is an attentive and calm mother and little Suki is friendly and curious.. and as clumsy as to be expected. Did I mention she’s the cutest little creature in the world?